What is an "Evony Farm Hub"? A Farm Hub (a.k.a. : "Collector City" or "Resource City") is a base that holds large sums of resources and is funded by several farm cities. This city often doubles as a treb city and placed next to a player. The concept of the hub is simple. While other farming bases feeding the hub have little or no defense this base should be the exact opposite. 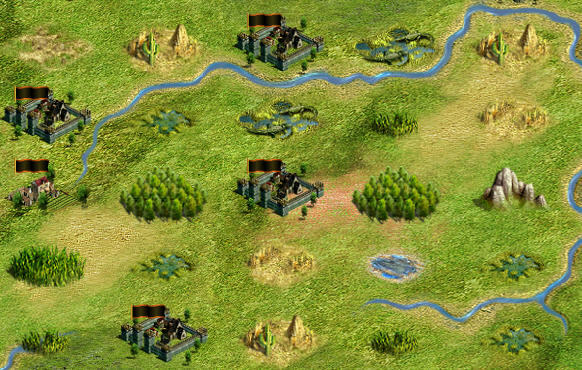 This is a location that has all your resources and the last spot you want to get plundered. 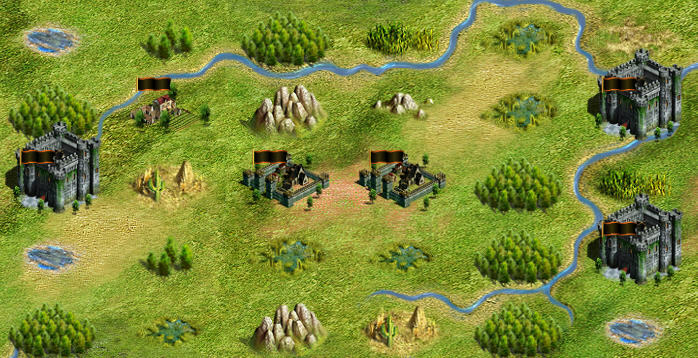 You are managing risk by having all resources in one location and ideally saving troop upkeep costs as you can defend the city with much more troops then just an average farm city and still cost less. You will defend this base at all costs through defending, trucing, holidaying and porting. A Farm Hub (a.k.a. : "Collector City" or "Resource City") is a base that holds large sums of resources and is funded by several farm cities. Something that is often overlooked when creating a hub is the natural surroundings, yet this is often one of the most important things. If you scan the map even for a short period of time you can find plenty of locations to make a hub. Rather then looking for the best farm spots you are looking for just the opposite. You want a spot with lots of valleys and little or no flats/npcs around it. Having no direct npcs or flats next to you is ideal. Here is an example of a single hub location. One of the best assets you may have as well, are your friends and neighbors that aren’t very reliable at playing. Those are the best people to enjoy this game with, especially if they reach knight and never go above 1 city. Your flaky friends can create an even more distance from you and potential enemies as long as they log in from time to time and don’t get their accounts deleted. If you have picked a good location for your hub and recruited unreliable friends you should have a 2-3+ mile buffer around your hub. This means 8+ mins per mile for mech waves. The most reliable passive defense would be mech defense. Keep in mind this defense takes time to break down if someone has the knowledge but probably the biggest advantage is it is very scout dependent. Assuming you have a lot of scouts this will deter your average attacker from even trying. Most dislike attacking unless they are 1 mile away and especially if they cant get a report. All of which will buy you valuable time. If you are looking for a location that you could have your hub/treb city next to an actual player you would be looking for something like this. Remember you are looking for as much spacing as possible. You do not want other players to be capable to “cap” a city directly next to you. As in the above example we have also found a location we can make into a hub/treb city to work with a player. In conclusion, if you are doing everything correctly you will have several farm cities with very little resources for plundering. You will have these cities maximizing resources and then shipping and ending up at your hub. Your hub should be heavily guarded and in a safe location. While you can have the peace of mind to ignore attacks against farm locations you defend your hub by any means. Your hub should be the easiest to defend as it’s set up defensively. Having a great hub city and all the cities supporting it will give you massive amounts of resources and help you make a name for yourself on your server.